For our Colorado film, I was looking forward to featuring one of the greatest films ever made, by which I mean, of course, 1984’s classic war film about a Soviet invasion of the United States: Red Dawn. Sadly, I found that the Patrick Swayze masterpiece was filmed in New Mexico. Sorry, Wolverine fans. Fortunately, there are other great films that are set and filmed in Colorado, at least in part. Christopher Nolan’s 2006 film about a deadly rivalry between magicians (played by Christian Bale and Hugh Jackman), The Prestige, takes place mostly in England. But a very important part of the film takes place in Colorado. Jackman’s character goes to Colorado Springs, Colorado, to ask Nikola Tesla for help in developing a magic trick. Tesla is played by David Bowie (one of many great losses of 2016). And the Colorado segments were filmed in Colorado. 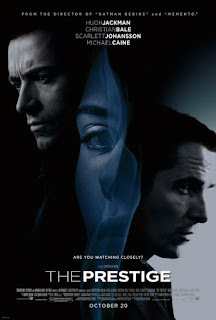 A number of the films set and filmed in Colorado, like The Prestige, take place only partially in Colorado. For instance, 1983’s Wargames has Matthew Broderick as a high school student In Seattle, Washington, but computer hacking and the threat of thermonuclear eventually bring him and a young Ally Sheedy to the Cheyenne Mountain Complex in Colorado Springs. National Lampoon’s Vacation (1983) is about a cross country family car trip, and one of the stops is Colorado (filmed in Pagosa Springs and Pueblo). The Chevy Chase comedy is not kind to old women and small dogs. Another very popular comedy, 1994’s Dumb & Dumber (with Jim Carrey) features a great deal of travel, including important stops in Estes Park and Copper Mountain, Estes Park and Copper Mountain. Two other sports films -- which also happen to feature teen romance -- were set and filmed in Colorado. 1978’s Ice Castles, about a world class figure skater, was filmed in Colorado Springs (and Minnesota). That film stars Robby Benson, as does 1977’s One on One about college basketball. It was filmed entirely in Colorado. There have been a number of Westerns set in Colorado, but they have often not been filmed there. 1953’s The Naked Spur, however, starring James Stewart and Janet Leigh and directed by the great Anthony Mann, did much of its filming in the Rocky Mountains of Colorado. And there is also a horror film that was filmed in Colorado. 1980’s The Shining, directed by Stanley Kubrick and starring Jack Nicholson, was filmed in Colorado. The film is about a man who takes his family to an isolated hotel in the Rockies. The family is all alone. Well, except for maybe the ghosts. And the madness. And the murder. It doesn’t seem the film could have done wonders for the tourist industry.